I'm an avid comic book and manga fan with a desire to make a career in these fields. I'm currently a Graphic Design student at the Santa Fe University of Art and Design, and the colorist for the webcomic How to Raise Your Teenage Dragon. Yuri Hasagashi has always been a shy girl. She's never been quite brave, and has little to no confidence in herself...despite the fact she can bench press a tank and bounce bullets off of her chest. 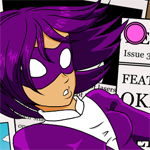 After the recent explosion of supervillain crime in the once peaceful (and hero-less) Oklahoma, (and a little nudging from her best friend Kat) the timid would-be heroine must step up to defend her city and her state as Iron Violet, Oklahoma's first superhero!